This convenient bike rack is user friendlyand easy to install. The wheel-mount was designed so that you don't have totake off your wheels, an you can lift the bike up onto the rack without a tonof effort. Rest the bike's wheels into the wheel hoops, ratchet down the hooksand you're ready to go. EASY-----This bike carrier providesastress-free way to transport your bikes. STABLE-----Each bike is secured atbothwheels and the at the frame providing a more stable and safe ride. SAFE-----Padded arms protect the bikeframesfrom accidental nicks and scratches during transport, ensuring your bikesarrive to your destination safely. NOVEL-----Cushioned hooks are adjustablefordifferent sized bikes and ratchet down for a tight fit.The innovativetray-style design makesloading and unloading easy and efficient. The AMAZON IKURAM shop is the onlyauthorized store and all infringements will be subject to complaints. EASY TO CARRY:The wheel loops fold up and the upright arm folds down for easy storage. 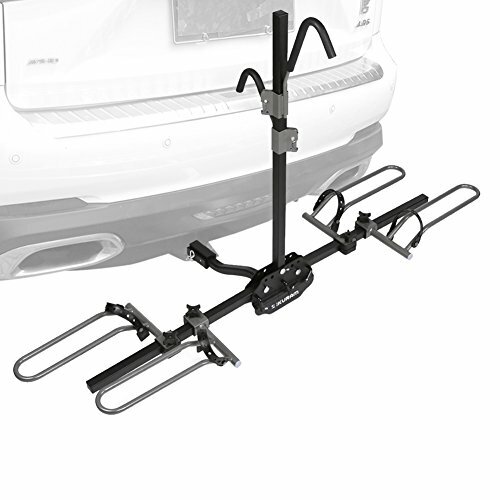 LOADING CAPACITY:Carries up to 2 bikes .Fits a 1-1/4" and 2" hitch receiver. Max load capacity: 35lbs per bike. Needs class III or IV hitch.